Fifteen-year-old Opportunity rover enters low-power mode in attempt to survive extreme tempest. A postcard from better days: NASA's Opportunity rover looks toward Endeavour Crater on Mars in 2012.Credit: NASA/JPL-Caltech/Cornell/Arizona State Univ. An enormous dust storm is blanketing much of Mars, blocking the sunlight that NASA’s 15-year-old Opportunity rover needs to survive. Mission controllers have not heard from the solar-powered Opportunity since 10 June. They believe it is in a low-power mode in which everything except its clock is turned off. “The rover has fallen asleep and is waiting out the storm,” says John Callas, Opportunity project manager at the Jet Propulsion Laboratory (JPL) in Pasadena, California. If the rover’s power level and temperature don’t drop too low — and predictions suggest they won’t — then Opportunity might be able to wake itself once the dust has cleared. That could take weeks. On 30 May, NASA’s Mars Reconnaissance Orbiter spotted the storm about 1,000 kilometres away from Opportunity’s landing site, which is just south of the Martian equator. The storm soon headed towards the rover. Within days, Opportunity saw sunlight dimming as atmospheric opacity — a measure of how much dust is in the air — soared. The rover’s energy production dropped by half over the course of 2 days, and then half again in a single day, Callas said during a media briefing on 13 June. In its last transmission, Opportunity reported that the level of atmospheric opacity was twice as high as had ever been measured on Mars. Then the rover went silent. The dust storm now covers at least one-quarter of the planet. It is likely to swaddle nearly all of Mars in the next few days, says Richard Zurek, the chief scientist at JPL’s Mars programme office. That would make it the first global dust storm on Mars since 2007 — which Opportunity weathered. One factor working in the rover’s favour is that Martian summer will soon begin at its landing site. That means that the days are growing longer and warmer. And the dust storm is also raising temperatures. Opportunity was designed to withstand temperatures as low as –55 °C. The coldest temperature predicted for the near future is –36 °C. “We should be able to ride out this storm,” says Callas. How long the tempest lasts will depend on how far it spreads — and how high it lofts Mars’s talcum-powder-like dirt into the atmosphere, says Zurek. A typical dust storm would dissipate in several weeks, whereas the very largest ones might persist for a few months. NASA’s Curiosity rover, which landed in 2012 about 2,200 kilometres away from Opportunity, is nuclear powered and not affected by the dust. The storm is expected to abate before the next NASA mission to Mars, the InSight lander, arrives in November. But there is always the chance that a second global storm could arise before then, Zurek says. InSight is expected to be able to survive a landing in dusty conditions. Why planet-wide dust storms appear in some years and not others is an enduring Martian mystery, Zurek says. On Earth, dust storms crop up in regions such as the southwestern United States or the Middle East but stop there. On Mars, such storms can grow quickly to much larger scales — especially when the planet reaches the point in its orbit that is closest to the Sun, and there is more solar radiation to heat dust particles and carry them aloft. Mars is just entering its dust-storm season, which typically occurs when it is autumn and winter in the northern hemisphere, and spring and summer in the southern hemisphere. It is relatively early in the season for a planet-encircling dust storm to begin, says Huiqun Wang, a research physicist at the Harvard-Smithsonian Center for Astrophysics in Cambridge, Massachusetts. Her team's atmospheric-modelling experiments suggest that a regional Martian dust storm that lasts for at least ten days could create the atmospheric conditions that would allow it to grow into a global event1. Most never cross that threshold. A flotilla of NASA spacecraft on Mars is measuring the ongoing storm in greater detail than ever before. “This is an unprecedented opportunity to learn more about Mars,” says Jim Watzin, head of the Mars exploration programme at NASA’s headquarters in Washington DC. Opportunity and its twin, the Spirit rover, launched in 2003 and arrived at Mars in January 2004. Both were designed to last 90 Martian days, or about 13 Earth weeks. 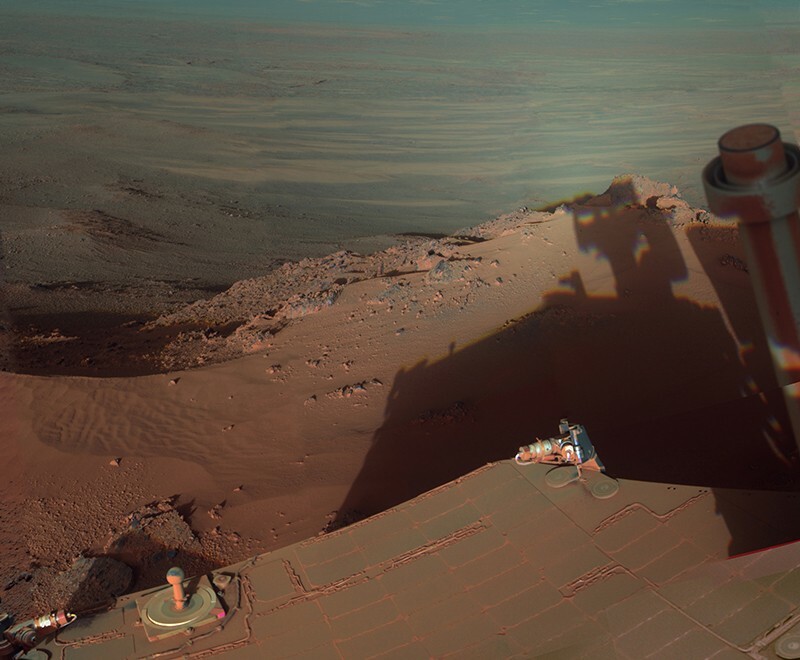 Spirit landed in Gusev Crater, on the opposite side of the planet from Opportunity, and drove nearly 8 kilometres before getting stuck in a sand drift in late 2009. Opportunity landed in a region called Meridiani Planum and, in 2011, reached a 22-kilometre-wide crater named Endeavour. It is currently sitting in Perseverance Valley, on the west rim of Endeavour. In its more than 5,000 Martian days on the surface, Opportunity has driven 45.16 kilometres — a record for any extraterrestrial vehicle. Its scientific legacy includes the discovery that non-acidic, life-friendly waters existed on Mars roughly 4 billion years ago. Correction 13 June 2018: The original version of this story misstated a﻿ conclusion of the study by Wang and colleagues. They found that a regional-scale dust storm that persisted for at least 10 days — not a local-scale storm — could possibly grow into a global event. Toigo, A. D. et al. Icarus 302, 514-536 (2018). Shirley, J. H. Icarus 251, 128-144 (2015).